Dscoop hosted its first conference of 2013 in the United States last week! The sold out Dscoop8 Annual Conference was held at the Gaylord Opryland Resort in Nashville, Tennessee. The conference attracted industry leaders from the graphic arts field, including printers as well as press and label manufacturers from all over the world. Spartanics was among the industry leaders exhibiting at Dscoop . 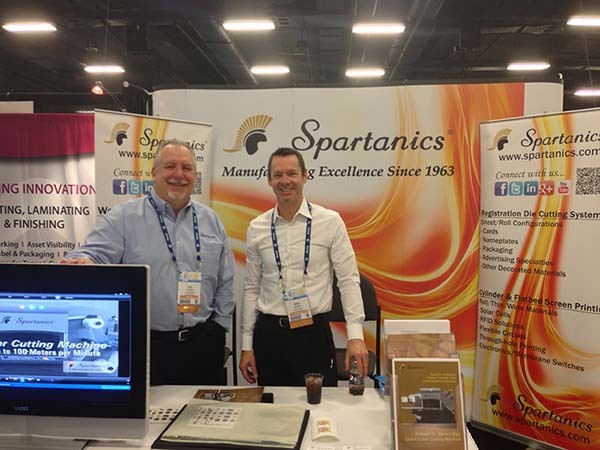 Celebrating their 50th anniversary, Spartanics met with and educated visitors about their advancements in product technologies relating to traditional die cutting equipment, laser cutting systems, screen printing applications and UV Ink Jet printing capabilities. Spartanics demonstrated the features and benefits of their latest innovation, the L-350 Laser Cutting Machine. Phil Trausch, National Sales Manager of Spartanics, stated “We learn so much from the attendees at these shows. It’s a wonderful two way street and we are always grateful for the opportunity to meet with the people in our industry”. Dscoop, Digital Solutions Cooperative, is a global community for professionals in the graphics arts and technical industry. Their mission is to provide education and networking abilities to their members in order to aid in the improvement of business growth, efficiency and profitability among its members. The Dscoop annual conference is the community’s most important event of the year.